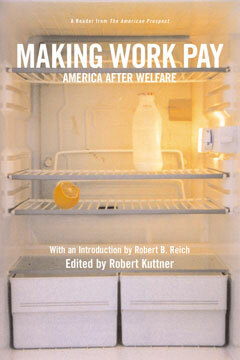 As Robert Reich notes in his introduction, “like other ideas that have had the misfortune of becoming political slogans, ‘making work pay’ went from obscurity to meaninglessness without any intervening period of coherence.” This book, which originated as a special double issue of the American Prospect, brings coherence to the original notion, and updates it for a new century. In Making Work Pay, leading policy analysts and journalists examine the broad fallout of welfare reform: Marcia Meyers shows how welfare offices undermine welfare reform; Naomi Barko reveals how the gender gap in wages hits low-income workers hardest; Harold Meyerson describes the growing movement to organize low-wage workers; and Michael Massing details welfare-to-work programs that actually work. Arriving as Congress considers the reauthorization of welfare reform, and including reports of state programs, Making Work Pay is a timely contribution to a pressing debate.